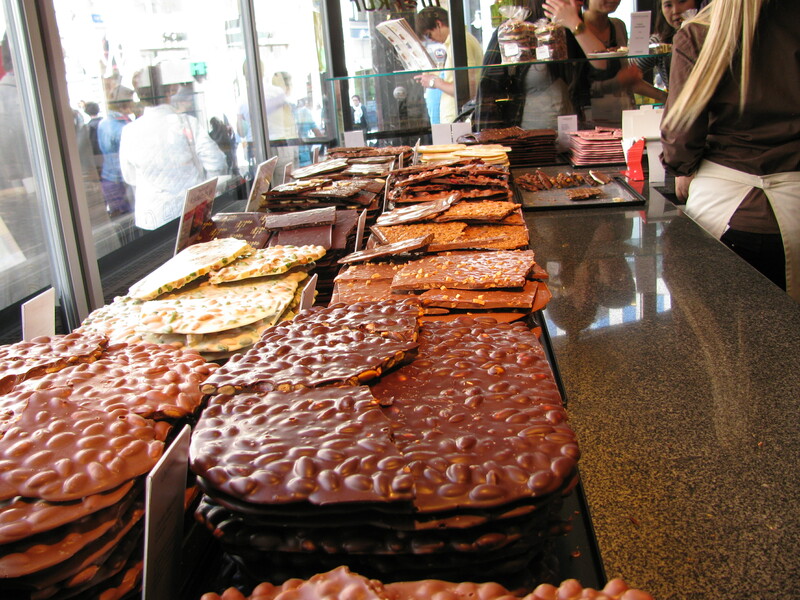 Swiss woman makes power play over transit authority. 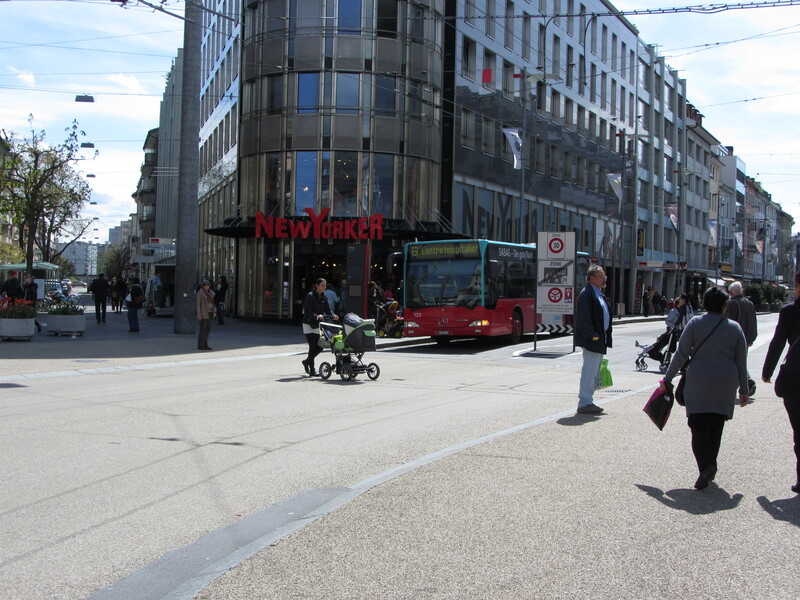 When a mother pushing a stroller challenges a bus on a Swiss street, you have to wonder if she’s hit the nadir of a post-partum-induced depression, because street-crossing in Switzerland has rigidly observed rules, one of which is, don’t mess with bus drivers. They see a pedestrian on the pavement as a challenge to their might and will push down on the pedal to make their point. Nonetheless, the mother won, because just as rock crushes scissors, mother-and-baby beats buses. Street-crossing is, in my view, a sociological and psychological indicator of many things. Every time you cross the street, you are saying something about yourself, your culture and your country. For example, a former work colleague hailing from Canada’s easterly region routinely plunged into downtown traffic as though she were made of impermeable titanium, not squishy skin-sheathed fluids. At first, I assumed this was part of her eastern provincial culture. Then I observed she was very much the same off the road, plunging into rants that shredded her colleagues into confetti, not giving a thought for the reputations she raked over. Once, a colleague challenged her and she delivered a soliloquy so far removed from the truth that it can be said that she regarded people the same way she regarded cars – mere objects that were destined to get out of her way. This is not to say that street-crossing methodology is an indication of sociopathic tendencies, but maybe it is a warning sign. 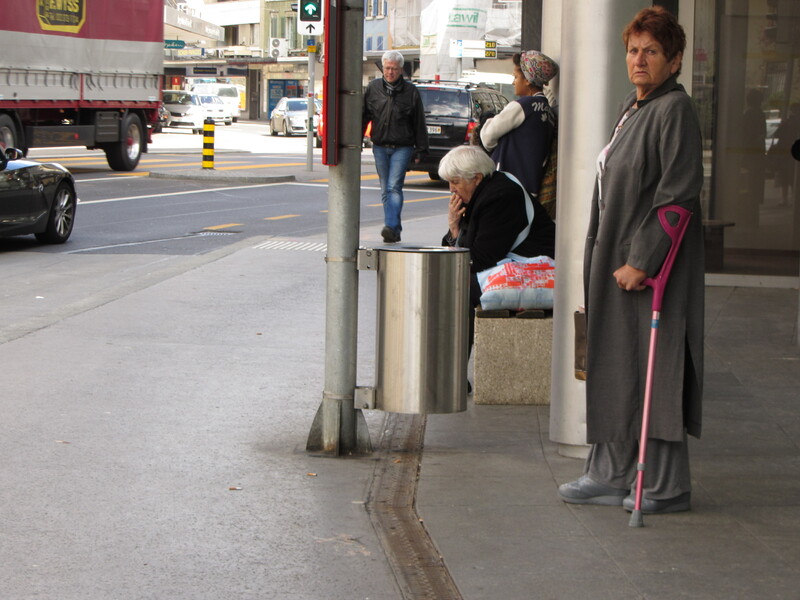 We see many people with crutches, canes and casts on Swiss streets, including young adults with twisted limbs and hobbled gaits. Other foreigners have observed the same thing, yet when we ask the Swiss about the multitude of injured on the streets, they don’t see anything unusual. We don’t know whether these are the ski or street-crossing wounded, but we sure wonder. In Canada, jaywalkers crossing the street at any point might peeve a few, but overall society takes a benign view of the practice and drivers will veer away should a pedestrian stride inside their trajectory. Still, something seethes under the surface: When city police in Victoria, British Columbia hold a ticketing-binge on jaywalkers it attracts heated and furious debate in the local media. But a ticket and maybe a tongue-scalding is the worst a Canadian will get for taking a shortcut. No such luck in Australia. There, street-crossing can be suicidal, because the streets belong to bus-drivers who slingshot their multi-tonne vehicles as though they are warheads. Death could very quickly follow every time one crosses the curb. This is why Aussies drink so much. They know every hour could be their last. I cannot speak for the dangers of street-crossing the world over, but I know that Spanish crosswalks are not to be trusted. While the Swiss abide by the rules, Spanish drivers are a hurried and opportunistic bunch, possibly because they are probably on their way home for a siesta, which might explain their current economic woes. I wish I was joking about this. Many a time at a Madrid crosswalk, I’ve seen the first car stop only to see cars two, three and even four pull up behind the first car, then pop out into the opposing lane and speed through the crosswalk. The first time I saw this, I nearly got hit. Having seen an x-ray of some Spanish orthopedic bone-mending with what looked like twist-ties, I vowed to never trust the Spanish medical establishment with my life, so I learned to never cross a crosswalk until all cars had passed. Here in Switzerland, street-crossing is a sign of social order. Crosswalks are everywhere, and even though Swiss drivers could likely outpace those Australian bus-drivers, they show a lot of respect for people inside the crosswalk, but not so much for jaywalkers who venture beyond the yellow-striped lines. More than once, I’ve seen vehicles speed up at the sight of a pedestrian attempting to strike out against the state-sanctioned road-crossings. Last week, a very swank looking gentleman driving a very expensive vehicle almost tapped a young man who dared cross the street against the light, and the motorist did not look one bit worried about grinding the man under his treads. The Swiss are ardent capitalists when it comes to money, but where street-crossing is concerned, they will push individualistic expression under the water every time. As is the case in almost all areas of life, the exception to all rules across the board belongs to females between the ages of 16 to 30. These stiletto-heeled women in their tight jeans, leather jackets and flowing manes do not even look before crossing the street. They just go without a hiccup in their pace because they know the world will stop for them. It looks like a wonderful world to be in, except for the day of reckoning that will occur sometime after they turn 30 when their toe the curb, and a car whips past without a glance at the gal. Then she will know she has passed her apex and is staring down into the nadir of middle-age. True, that is still a long ways off, but having to look before crossing a street is a sign that it will come.